This year, we were actually traveling for the entire 2 weeks around her birthday. 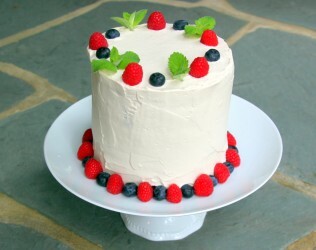 I wasn’t going to be in my kitchen or have the tools necessary to make my very favorite vanilla bean cake for her (recipe here). I also wasn’t going to have much time at all, since we were arriving at my folks house the day before. 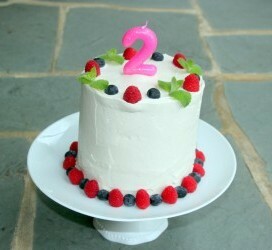 I was so excited to make this SIMPLE, EASY, FAST and few-ingredient ‘cake’ that I KNEW my daughter would LOVE! What are some of your child’s favorite foods or fruits? Well, for my daughter strawberries (in last years cake!) and watermelon tops the list! 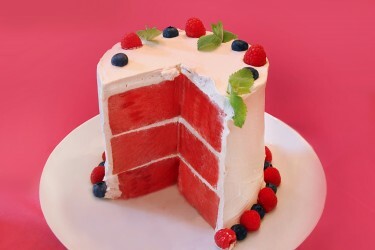 So I made her a watermelon cake! I was a bit nervous as to the reception it would receive from the older generation of ‘traditional’ folks at the party. I can’t even tell you how touched, surprised and happy I was that EVERYONE, from ages 2 to 93, LOVED the cake. From the taste to the creativity, it was a big hit! I used my coconut whipped cream as the frosting and filling between the layers. Have less time? Skip the layers! For the kiddies, I made watermelon cupcakes! So easy and cute too! 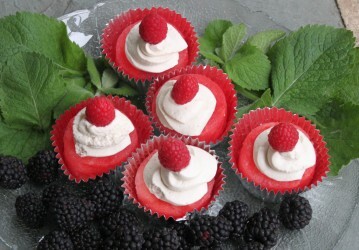 I used a glass to cut out a watermelon ‘cupcake’ and piped my coconut cream frosting on top! I like the coconut cream since it’s vegan (so if folks have dairy allergies or are kosher and you’re serving meat) most everyone can enjoy it! If you want to find out why watermelon is so great, check out my article on the topic here! If you try this recipe, please share your photo and tag me on Facebook page or Instagram! I’d love to see your healthier creations! Great idea! I’ll try and take some in-progress pics next time, but basically I just got a big watermelon, cut three 2″ thick discs from the very center, and then trimmed them down until they were all the same size. They weren’t perfect, so I used a little extra whipped “cream” to smooth over the gaps!